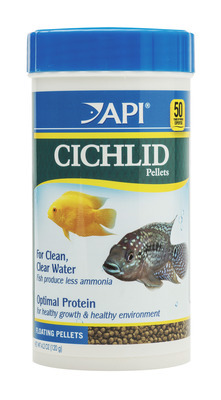 Laboratory testing has proven that API Fish Food delivers up to 30% less ammonia than the leading competitor. Overfeeding, low palatability, and low quality lead to unconsumed or poorly digested food, which raises the ammonia level in the aquarium, causing cloudy water and even fish death. API Fish Food diets contain a unique, nutritionally enhanced protein to ensure easy uptake of nutrients, for maximum absorption. Fish more readily use the nutrients and release less ammonia, for clean, clear water. To learn more about the science behind our new formula, click here. Feeding Guide: Feed twice a day. Feed the amount of food your fish will consume within 3 minutes.